Carl Frampton is to defend his IBF world super-bantamweight title against mandatory challenger Chris Avalos in Belfast in February or March, 2015. Cyclone Promotions have confirmed that both boxers will attend a press conference next week to announce the date and venue for the contest. 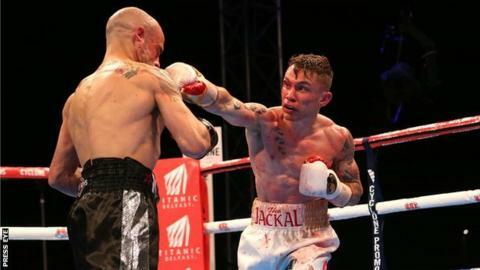 Unbeaten Frampton beat former champion Kiko Martinez on points to secure the title at Titanic Quarter in September. He suffered hand damage in the process but has recovered to resume training. Frampton emerged victorious from a gruelling 12-rounder against Martinez to maintain his record of 19 straight wins. The Odyssey Arena appears to be the likely venue for the fight, with the King's Hall another possibility. Californian Avalos, 24, stopped Yasutaka Ishimoto in May to become the mandatory challenger and since then he has stopped Jose Cen Torresto to take his career statistics to 25 wins and two losses. His two defeats have come against Christopher Martin and Jhonatan Romero and his defeat of Ishimoto in China is the only time he has fought outside the United States. Frampton and his manager Barry McGuigan will hope that a victory would open the door for a unification showdown with WBA champion Scott Quigg next summer.